Something is not right with the flowers in Fairyland! 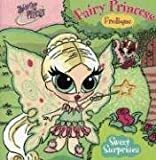 Princess Frolique finds a red rose with ladybug spots, a sunflower that buzzes like a bumblebee, and a field of bluebells that glow like fireflies. These special flowers are the work of Princess Frolique's best friend, Princess Pyxis. Princess Frolique and Princess Pyxis are playful fairies who know that sweet surprises are always fun!